With every new release of Concentration - the Memory Games a dozen new game options are introduced. Although the Option dialog box has a standardized user interface and a clean look and feel, its complexity might scare off less experienced users. For players who don't want to temper with advanced game options and sophisticated preferences, version 5.0 introduces Game Wizard: to set basic game options step by step. Every time the value of a step is unequivocal, the step is skipped. When all the steps are completed the Game Wizard shows a confirmation page to summarize the changes you made. In that point you can accept the changes and start a new game, or go back any number of steps to reset some options. 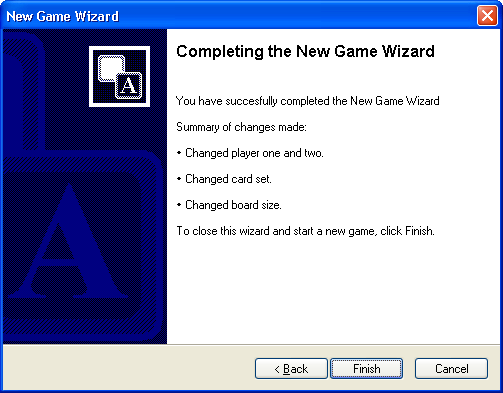 When you click Finish, Game Wizard always starts a new game. To replay the previous game, to start a tournament or a stress-free game use menu items in the Game menu. 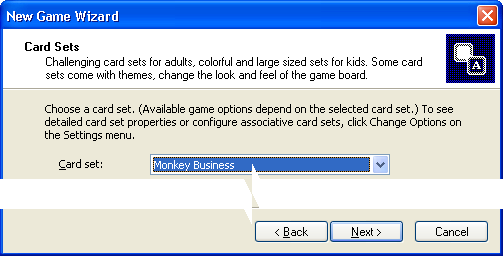 To change advanced options, click Options in the Options menu. In this moment Concentration - the Memory Games 5.0 is not yet available. That's why this post is categorized under Feature Preview.